Even before his arrest, trial and acquittal on spy charges in the 1970s, most New Zealanders had heard of Dr W.B. Sutch. He was – as his defence counsel claimed when arguing for name suppression – a prominent citizen, known for his work as an economist, writer, public servant and diplomat. William Ball Sutch was born in England on 27 June 1907 and arrived in New Zealand aged eight months. After completing an MA and BCom at Victoria University College he was granted a fellowship to the Department of Economics at Columbia University in New York. After completing his PhD with a thesis on ‘Price fixing in New Zealand’ at Columbia in 1932, he used the balance of his grant money to travel through the United States, Europe, India and Afghanistan. When Sutch returned to New Zealand in late 1932, the country was in the depths of the Depression. He was unemployed for a time but in early 1933 began relief teaching in Whanganui and Palmerston North. Later that year he was recruited to the ‘Brains Trust’, a group of talented economists and civil servants who advised the Minister of Finance, Gordon Coates. When Walter Nash took over as Minister after the 1935 election, Sutch began accompanying him as private secretary on trade negotiation visits to England, Germany and Russia. Sutch continued to work for the Minister of Finance until 1941, when he moved to the Ministry of Supply. In June 1942 he entered the army, serving in New Zealand as a gunner and later a gunnery instructor. It was during this period that Sutch’s books Poverty and progress in New Zealand (1941) and The quest for security in New Zealand (1942) were published. Both were versions of a social history commissioned but rejected as a centennial publication in 1940. When he was discharged from the army in 1943 he returned to work for the government. After the war Sutch took up posts with the United Nations, first in the Pacific and later in Europe. 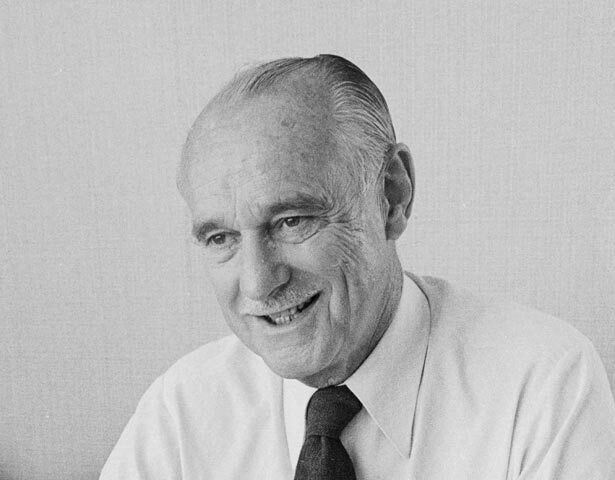 He returned to New Zealand in 1951 and worked at the Department of Industries and Commerce, rising to Permanent Secretary in 1958. In 1973 he was appointed Chair of the Queen Elizabeth II Arts Council of New Zealand. He returned to this position immediately after his acquittal but his health had worsened, and he died on 28 September 1975, almost a year to the day after his arrest. Tributes flowed after Sutch’s death. Prime Minister Bill Rowling’s comment that Sutch’s career was ‘often controversial but more often [made] a real contribution to the development of New Zealand society’ was perhaps more muted praise than the long-serving public servant would have received a year earlier. But other commentators did not hold back, hailing Sutch as ‘a champion of New Zealand’ and a ‘man of vision’. Despite his eventual acquittal and the tributes paid on his death, public memory of Sutch remains overshadowed by his arrest and trial. But his contribution to New Zealand has not been forgotten. Brian Easton contributed a brief biography of Sutch to the Dictionary of New Zealand Biography. He also devoted two separate chapters to him in The Nationbuilders, a book of ‘essays on individuals and companies in the years from 1931 to 1984 who contributed in major ways to building a New Zealand nation’. General histories of New Zealand record his work as an economist, writer, public servant and diplomat. We have 1 event in history, 3 biographies, 12 articles, 3 comments related to Bill Sutch. Forty years after he was acquitted of spying, electrifying new evidence has emerged showing that top government official Bill Sutch was a KGB recruit working under the codename "Maori". The Dominion Post has obtained copies of official KGB records that show Sutch was a 24-year veteran recruit of the feared Soviet spy agency when he was arrested while meeting a KGB agent at an Aro Valley park, in Wellington, in 1974. But his daughter says the evidence does not match her father and maintains he was not involved with the Soviets. Sutch was acquitted of a charge of obtaining information helpful to the enemy, following a sensational five-day trial. Forty years later, the records provide the KGB's answer to the enduring question from New Zealand's greatest spy scandal: Was Sutch, a brilliant and senior bureaucrat who influenced several prime ministers, a Soviet spy? Smuggled out of Russia by a KGB defector, the papers also provide coded details of other Kiwis the KGB recruited during the Cold War. They even reveal the KGB's New Zealand budget, showing that the year Sutch was arrested, their safe held a surplus $2504.64. The documents don't name Sutch but the details clearly identify him and state he was recruited in 1950. Given the codename "Maori", the records say Sutch was in contact with a KGB agent, Drozhzhin. The former SIS agent who caught Sutch in a clandestine meeting with KGB agent Dmitri Razgovorov in Holloway Rd, said the documents vindicated SIS attention on Sutch. "I'm delighted . . . not because I want to stick it to Bill Sutch, but because I always knew it to be true," former agent Kit Bennetts said. "It is important we don't run from our history, no matter how uncomfortable it might be." It was regrettable Sutch refused to co-operate when confronted with evidence of his previous meetings with the KGB agent, Bennetts said. "What we really wanted to know was what he'd done in the past. There was no desire to send him to prison. If he'd co-operated he would have got his knighthood and no-one would be any the wiser." I'm confident Bill Sutch was never a director of the Reserve Bank. This biography should also include another event of historical significance. "The Sutch Search" as it became known, was instrumental in the formalization of search and rescue activity in New Zealand.